Welcome to North Kansas City’s Eclipse Volleyball Club KC. We are dedicated to building each athlete’s character through the sport of volleyball. It is our goal to develop each player’s self-esteem, leadership, and confidence. This development leads to athletes using their unique talents for volleyball and life. At Eclipse our goal is to “train up” every athlete that we work with. We work individually with each player’s goals; from making their school’s volleyball team, to becoming a leader on the court. Whatever the goal is we want to help. Eclipse offers teams that compete locally and regionally. Our program includes players that range from 10 to 18 years old. Eclipse practices at Flash Performance. The practice location is near the following suburbs: Parkville, Gladstone, Liberty, and Kearney. In addition to developing each athlete’s volleyball skills, we incorporate a strength and conditioning program developed by Flash Performance. Players can also request private lessons with the Eclipse coaches. We encourage parents and players that are looking for a new experience to contact us for more information. Why Join Eclipse Volleyball club? It is our club’s goal to “train up” every athlete that we work with. We want players to love playing volleyball. Our experienced coaching staff provides age-appropriate training in a fun, safe, and competitive environment. All Eclipse Volleyball Coaches are registered with the Heart of America Volleyball organization. Flash Performance is conveniently located near I-35 North. Parkville, Liberty, and Kearney parents can drive to our practices within 10 to 25 minutes. This location provides parents a waiting area with seating, TV, and Wi-Fi. Using the Flash Performance development plan, our club trainers provide players’ speed, jump, and agility exercises. The extra training benefits our athlete’s volleyball performance. 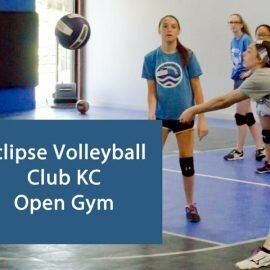 Eclipse Volleyball Club KC cares about each athletes’ development. Our Coaches provide a positive environment for players to learn volleyball skills and gain experience to becoming an active player for their school team. We look forward to the unique talents they develop with us which will benefit them into adulthood. 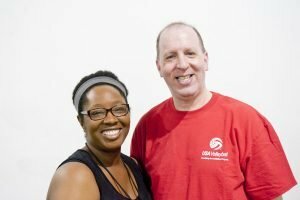 Co-directors Diane Allen and Charles Cooper are excited about starting their inaugural season as Eclipse Volleyball Club KC. Please visit our Coaches Page for Coach Diane and Charles’ Bios. Both directors look forward to meeting new players and their families for the 2018-2019 Volleyball season. Please visit our latest news page or event calendar about future open gym/tryouts. See Kansas City Northland's Eclipse Volleyball Club teams and players in action. Many of the pictures were taken at various Kansas City area Heart of America Volleyball Tournaments. Eclipse Volleyball Club KC offers Parents fundraising opportunities to offset each player's cost for the season. Fundraisers include selling coupon books and scented candles. North Kansas City's Eclipse Volleyball Club KC has selected Mizuno as our club's teamwear supplier. Look for future announcements regarding a link to our mizuno spirit wear store. Contact our Club for Private Volleyball Skills Training!